The pristine, crystal clear waterways and beaches of Anna Maria Island await those looking to get out and explore on one of our self guided rental options. Come explore the Intracoastal Waterway or Sandbar on your own kayak. Anna Maria Island and it's waterways are one of Florida's jewels. 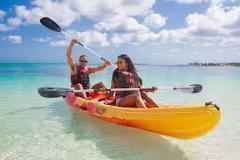 Kayaks are available for single or double (tandem) riders. Tandem kayaks may support a small child as a third rider if total weight limit is not exceeded. Launch sites from the Kingfish Boat Ramp and the South Couqina Boat Ramp available. Whether new to kayaking or an experienced paddler, come experience our beautiful island by water. We will equip you with the proper safety gear and instruction to assure you have a great time on the water. Price includes paddle and safety vest for each rider. Price is per kayak. We recommend you wear clothing that can get wet, and bring water/hydration for your journey. Hats, sunscreen and sunglasses are also a good idea.